Stata for Mac statistical software is a general-purpose system intended for use by medical researchers, biostatisticians, epidemiologists, economists, sociologists, political scientists, geographers, psychologists, social scientists, and other research professionals. Stata for Mac is available for Windows, Macintosh, and Unix computers and provides full data management, graphics, statistical, and matrix language capabilities. a general-purpose data analysis and statistical software. ...... 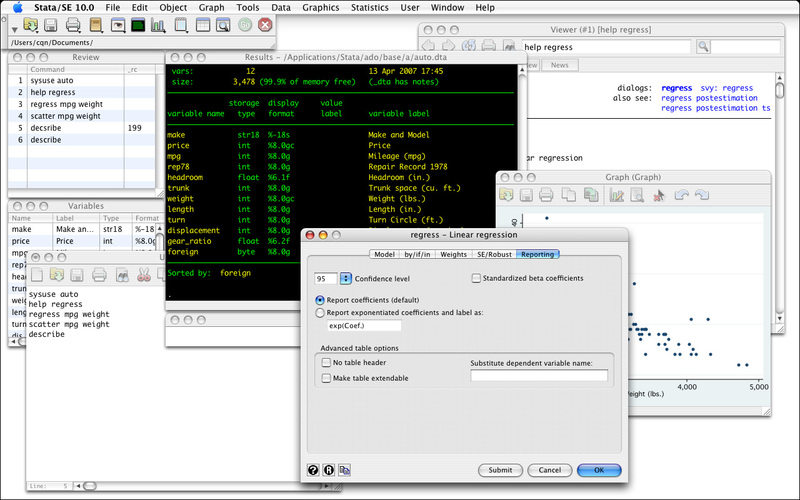 In addition to general-purpose capabilities such as summary statistics, ANOVA, linear, logistic, and probit regression, and the like, Stata provides survival analysis including Kaplan-Meier survivor function estimates, Cox proportional hazards models, survey analysis, time series, multivariate analysis, and panel data estimators including random-effects, fixed-effects, and multilevel mixed-effects for continuous, binary, and count outcomes. Stata 11 adds many new features such as multiple imputation, factor variables, generalized method of moments (GMM), competing-risks regression, state-space modeling, predictive margins, a Variables Manager, and more. Qweas is providing links to Stata for Mac 11 as a courtesy, and makes no representations regarding Stata for Mac or any other applications or any information related thereto. Any questions, complaints or claims regarding this application Stata for Mac 11 must be directed to the appropriate software vendor. You may click the publisher link of Stata for Mac on the top of this page to get more details about the vendor.